I KNOW. We’re seriously doing hash brown quiche and I am dying. Crispy, crunchy potato crust. Cheesy filling with spring veg. I can’t get enough. Really, just looking at that creamy custardy filling. I first saw the idea of a hash brown crust on epicurious. We could say I was instantly sold. I don’t care about hash browns on the regular but if they are the crust to my quiche? I’M IN! Here’s the thing though – I definitely thought it wouldn’t work. I thought it would be too tricky, the potatoes would crisp up enough, or the crust would stick to the pan and I’d end up serving a crustless quiche. I was like there is NO WAY this will work. This means I am so excited to tell you that it DOES work. It’s more time consuming than a crustless quiche, but it’s not as bad as a pie crust, so that all evens out. And as long as you use a cast iron skillet, add enough oil and butter to the pan and really press down on those shredded potatoes, you’ll do it. It’s SO good. It seems like these days, I share a quiche twice a year! And that’s pretty much when we eat them, around Christmas and Easter. 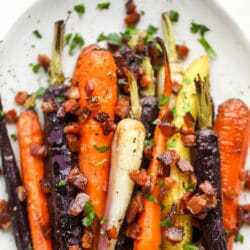 But they are so much more versatile than that and I want to start making one on the weekends to prep lunches or even make one as a weeknight dinner. 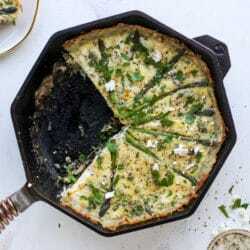 I love quiches because you can eat them cold and they are SO good with a greens salad. And they’re insanely satisfying too. Paired with the greens, I consider it somewhat healthy. Despite all the cheese. Since this quiche has the crisped crust, I do prefer to eat this shortly after baking. But after a day or two, it’s still fantastic. The potatoes may not be quite as crispy but they are still flavorful. And I’ll tell you a little secret: to reheat this, place it with the crust down in a hot skillet. That gives it a bit more crisp than the oven or microwave does! 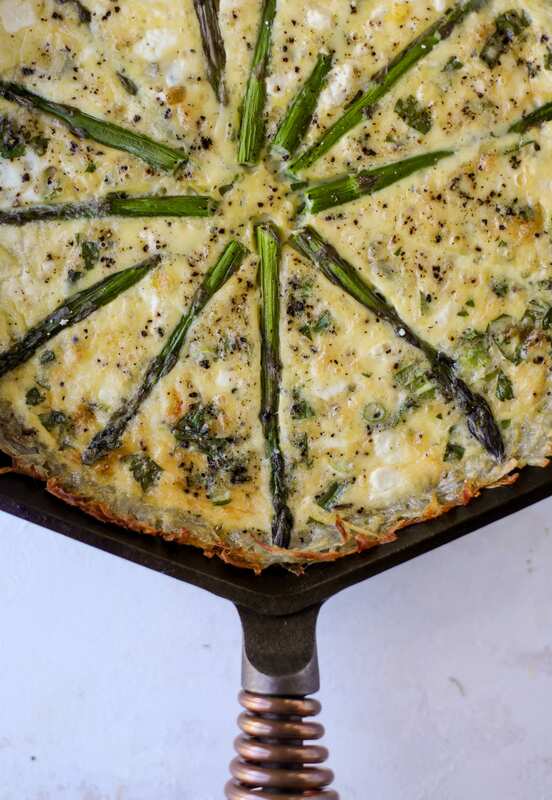 For the insides of this quiche, I did lots of cheese, of course, tons of fresh herbs and asparagus. 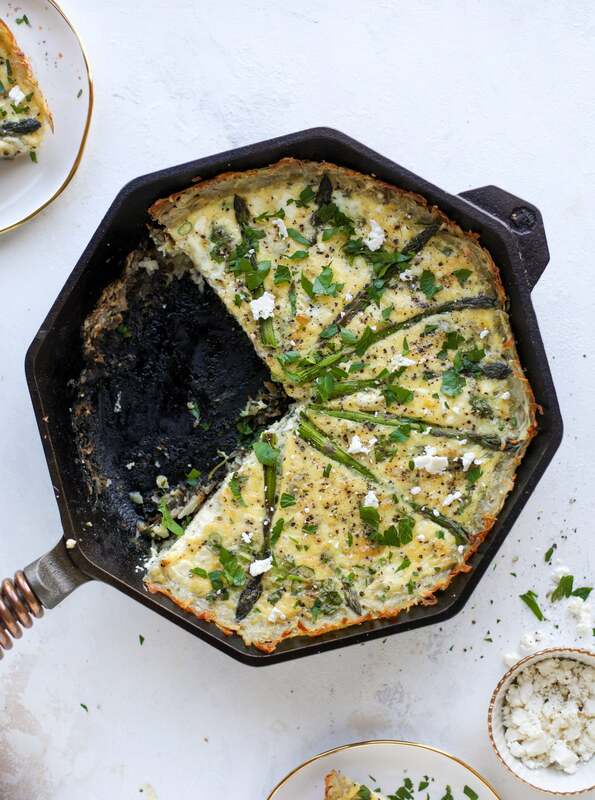 As usual, I’m having a MOMENT with asparagus right now so get ready for asparagus overload! This hash brown quiche is such a fantastic meal! Perfect for brunch or dinner, the bottom is a crispy hash brown crust and the filling is divine. Grate the potatoes into a large bowl (I use a cheese grater!) and sprinkle with salt and pepper. Gather all the potato shreds up in a kitchen towel and squeeze out as much of the liquid that you can. Sort of like you would with cauliflower crust! Heat a 10-inch cast iron skillet over medium heat. Add the oil and butter. Once it has melted, start pressing the potatoes in the skillet to form a crust. You want the layer to be even. I used a wooden spoon, metal measuring cup and spatula to continuously press the potatoes down and up the sides. You want to do this, pressing often, until the bottom and edges of the crust brown, about 10 to 12 minutes. Turn off the heat under the skillet. Whisk together the eggs, garlic, cream, cheese, salt and peppers. Fold in the fresh herbs and chopped asparagus. Pour the filling into the crust. Place the long asparagus spears gently on top in a circle design with the top of the spear facing outward. Bake the quiche for 35 to 45 minutes, or until golden on top and set in the center. Let the quiche cool before serving. Sprinkle with additional feta and herbs. To serve the quiche, use a sharp knife to cut down through the potato crust. This is so good served warm or cold! Dinner tonight! Yum! From experience, a fruit salad also compliments quiche very nicely. You missed a step of pouring the mixture into the hashbrown crust, I think for someone who hasn’t made 1000 quiches, they will need to know that. This looks amazing! Can you make it with frozen hash browns? yes you can use frozen hash browns, however i would probably let them thaw first and squeeze out some of the water! Love these flavors and ohmygoodness I want all of my meals to come in a crispy hash-brown crust now! I totally agree about quiche as dinner too, I love serving it alongside a green salad for a lighter meal – perfect for spring! Can’t wait to try this, my son can’t have wheat so this sounds like a perfect crust that I can use for all savory pies. This recipe sound delicious, it has all my favorite ingredients. love that! thank you charlotte!